Get a clean surface on any driveway, walkway, or path with this Meyers 28550 80 inch Power Angle Drive Pro Plow that attaches to most standard UTV’s with a class 3, 2 inch front receiver hitch mount. Just like a traditional plow, you can operate the left/right and up/down motion from inside your vehicle. And, plowing is a breeze with the 80 inch steel plow that’s coated with Dura-slick paint for fast snow roling action. *Utilizes the vehicles existing central hydraulic system. Power Angle: Control the plows up/down and left/right motion from inside the vehicle with a remote control, just like a traditional plow. 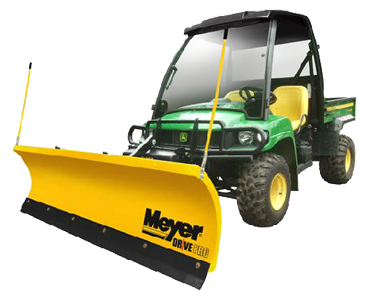 Vehicle Applications: Mount this snow plow to any heavy-duty UTV. Integrated Wheels: Easy to store and mount with the integrated wheels. Quick-Link Mounting: Use the EZ Mount to quickly attach this plow to Class 3, 2 inch front receiver hitch. Full Trip: Enables the whole plow to trip forward when plowing for maximum protection to the plow and the vehicle. Plow Material: Plowing is a breeze with this 80 inch plow that’s designed out of durable steel and coated with Dura slick™ paint for better snow plowing action. 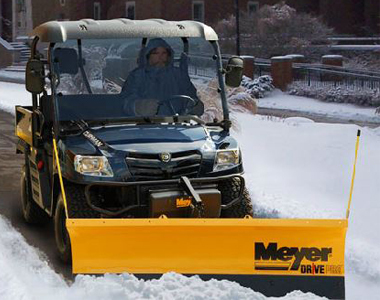 Ask us about the Meyer 28550 80" Power Angle Pro UTV Plow. Please no repair questions. Your Q&A may be posted to SnowblowersAtJacks.com to help other shoppers, like you, with their purchasing decisions. Thank you.